I feel like a boiled lobster, red-faced and raw, lying prostrate on a slab where millions of others have been cleansed before me. For my induction to the age-old ritual of the hammam, I have chosen one of Istanbul's most historic baths, Cemberlitas (www.cemberlitashamami.com), which was built in 1584 by Nurbanu Sultan, the wife of Selim II, who was known for his love of pleasure over politics. 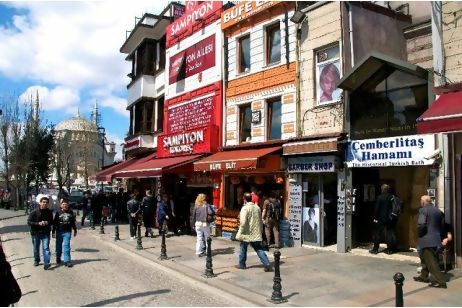 Situated on Divanyolu Street in the heart of the city, and among Istanbul's greatest monuments - it overlooks the Column of Constantine and is close to the Grand Bazaar and Sultan Ahmet or Blue Mosque - the tall double-domed building is sandwiched in between local shops - a barber's, fruit and vegetable shop - and a traditional Turkish cafe. Today, Cemberlitas has to shout its presence by a huge white sign and narrow steps leading down to the front doors.